ABSTRACT. Gillnets are recognized globally as one of the fishing gears with the highest levels of bycatch and mortality of sea turtles. Through onboard observer monitoring from July 2013 to June 2014 we assessed the bycatch of sea turtles by an artisanal gillnet fishery operating from Sechura Bay, Peru. One hundred and four sea turtles were incidentally caught in 53 observed fishing sets. The observed species composition of bycatch was green turtle Chelonia mydas (n = 100), hawksbill Eretmochelys imbricata (n = 3) and olive ridley Lepidochelys olivacea (n = 1). Bycatch occurred in 62.3% of monitored sets, with an average of 1.96 turtles caught per set. For all sea turtles combined, 28.8% of individuals were dead and 71.2% were alive at the time of retrieval. The majority of individuals caught were classified as juveniles and sub-adults, with an average carapace length (CCL) of 57.3 ± 0.9 cm for green turtles and 40.2 ± 2.4 cm for hawksbills. The mean annual catch per unit effort (CPUE) of sea turtles was 1.11 ± 0.31 turtles km-1 12 h-1), but varied by seasons. These results suggest that Sechura Bay is an important developmental habitat for juvenile and sub-adult green turtles and hawksbill turtles, but one subject to intense fishing interaction pressure. The development of monitoring programs, local awareness-raising activities, and enhanced management and protection of this critical foraging area and developmental habitat is recommended. Keywords: sea turtles, CPUE, gillnet, bycatch, Sechura Bay, Peru. Five species of sea turtles are known to occur in the Peruvian waters, the olive ridley (Lepidochelys olivacea), green (Chelonia mydas), hawksbill (Eretmochelys imbricata), leatherback (Dermochelys coriacea) and loggerhead (Caretta caretta) (Hays-Brown & Brown, 1982; Eckert & Sarti, 1997; Alfaro-Shigueto et al., 2004, 2010a; López-Mendilaharsu et al., 2006; Castro, et al., 2012). Research suggests that the Peruvian waters are primarily used as a foraging habitat (Hays-Brown & Brown, 1982; Alfaro-Shigueto et al., 2002; Santillan, 2008), although recent studies have confirmed the presence of green and olive ridley turtles nesting along Peru's highly developed northern coastline, making Peruvian coast the southernmost sea turtle nesting habitat in the eastern Pacific (Kelez et al., 2009; Velez-Zuazo et al, 2014, SWOT, 2015). In recent years, it has become apparent that vessels from small-scale fisheries (SSF) using trawls (Lewison et al., 2004), gillnets (Murray, 2009), seine nets, pound nets (Gilman et al., 2010), longlines (Casale, 2008, 2010; Alfaro-Shigueto et al., 2011), and many other gears types all incur in sea turtle bycatch (Moore et al., 2010). Fisheries bycatch has been identified as an important factor in many population declines, included of sea turtles. These populations can decline over short timescales, often without detection (Lewison et al., 2004). This situation poses a serious threat to many sea turtle populations and their conservation efforts (Lewison et al, 2004; Alfaro-Shigueto et al, 2008; Dutton & Squires, 2008; Koch et al, 2013). Within the Peruvian fisheries sector, SSF are particularly important because of their role in food security, but also as a source of employment (Mangel et al, 2010; FAO, 2010; Alfaro-Shigueto et al, 2011). Operating along the entire Peruvian coastline, the gillnet fishery comprise the largest component of Peru's small-scale fleet and it is conservatively estimated to set 100.000 km of net per year (Alfaro-Shigueto et al., 2010b). Recent studies show that gillnet fisheries in Peru have high interaction rates with sea turtles and exert significant pressure on sea turtle populations throughout the Pacific (Wallace et al., 2010; Alfaro-Shigueto et al., 2011; Lewison et al., 2014). The frequency of interactions depends on spatiotemporal overlap between critical habitat for a given species and fishing activities, encompassing a wide range of fishing methods and gear characteristics (Wallace et al., 2008, 2010). The purpose of the present research was to evaluate the incidental capture of sea turtles in the artisanal gillnet fishery in Sechura Bay, northern Peru, considering this bay is an important area for development of small scale fishery, but also an important foraging area of juvenile sea turtles. Sechura Bay is located on the northern coast of Peru in Sechura Province, Piura Department (5°12'-5°50'S and 80°50'-81°12'W) (Fig. 1). Is the largest bay in Peru and an important and traditional zone of artisanal fishing and mariculture (GORE - Piura, 2012; Moron et al., 2013). The study was conducted in Sechura Bay from July 2013 to June 2014. Data was collected by trained onboard observers as part of a program to monitor the small-scale bottom set gillnet fleet operating from Constante port (5°35'S, 80°50'W). Fishing boats ranged in length from 6 to 10 m and each trip consisted of setting of bottom set gillnets. Bottom set gillnets were made of multifilament twine and were composed of multiple net panes that measured 56.4 m long by 2.8 m high, with a stretched mesh of approximately 24 cm (Alfaro-Shigueto et al., 2010b; Ortiz et al., 2016). Typical to this fishery, nets were deployed in the late afternoon, soaked overnight and retrieved the following morning. The soak time ranged from 12 to 24 h (Lopez-Barrera et al., 2012; Ortiz et al., 2016). The target species in this fishery are flounder Paralichthys spp., guitarfish Rhinobatos planiceps and other species of ray from the Batoidea superorder as common stingray Dasyatis spp. and round ray Urotrygon spp. (Tume et al., 2012; Ortiz et al., 2016). Onboard observers recorded specific data about the fishery operation, including information on gear characteristics (e.g., net size and number of panes, number of sets), environmental data for each set (e.g., location, time of set and haul, sea surface temperature, water depth, and water visibility), and information on each sea turtle bycatch event. Incidentally captured sea turtles were brought onboard the boat for handling. We proceeded to untangle each individual and assessed its basic condition (alive, inactive/drowned or dead). Those individuals recorded as inactive/drowned, were rehabilitated following the handling and resuscitation techniques described on the NOAA Southeast Fisheries Science Center website for onboard observers (www.sefsc.noaa.gov/seaturtlefi-sheriesobservers.jsp). Information collected for each turtle included species identification, the geographical position (latitude and longitude) of capture, capture condition and final fate (released alive or discarded dead), and curved carapace length (CCL; measured from the nuchal notch to posterior-most tip) (Bolten, 2000). Measurements were made using a metric tape (±0.1 cm). Sea turtles determined to be in good condition were tagged with Inconel tags applied to the trailing edge of both front flippers and were released. Dead turtles were measured and then discarded at sea. For all sea turtle individuals, skin sample were taken for further studies. Individuals of C. mydas, with a CCL ≤69 cm. were considered as juveniles, individuals with 69 ≤CCL <85 cm. were considered as sub-adults, and individuals with a CCL ≥85 cm. were categorized as adults (Zarate et al., 2013). Individuals of E. imbricata, with a CCL ≤74 cm were considered as juveniles, individuals with 74 < CCL <81.6 cm. were considered as sub-adult, and individuals with a CCL ≥81.6 cm were categorized as adults (Liles et al., 2011). Finally, individuals of L. olivacea, with a CCL ≤59.2 cm were considered as juveniles, individuals with 59.2 ≤CCL < 64.9 cm. were considered as sub-adult and individuals with a CCL ≥64.9 cm were considered as adults (Barrientos-Munoz et al., 2014). Sea turtle bycatch per unit effort (CPUE) was determined as: CPUE = number of turtles captured / (net length [km]) × (soak time of net [12 h]) (Wang et al., 2013). Gillnet bycatch data for the study was grouped by month in order to derive monthly stratified CPUE estimates. These data were calculated in terms of catch set-1 (Mangel et al., 2010). However, to facilitate comparison with other studies, catch per km h-1 was also calculated. Descriptive statistics are presented as mean ± standard deviation (SD). The annual bycatch rate in Constante port was also calculated, according to Alfaro-Shigueto et al. (2011) applying their same estimates of fleet size and fishing effort (8 fishing vessels, 30 sets per month), the best available estimates this fishing fleet's size and effort for this port. Maps of fishing effort and turtle captures were prepared using MAPTOOL (Seaturtle.org, V. 2002, available at www.seaturtle.org/maptool). Fifty-three fishing sets were monitored (Fig. 1), 15 on winter (April to June), 10 on spring (October to December), 14 on summer (January to March) and 14 on autumn (July to September). Nets averaged 1.12 ± 0.02 km in length (range = 0.88-1.45 km) and 19.09 ± 0.45 h of soak time (range = 10.22-28.52 h). Sea turtle bycatch totaled 104 individuals. One-hundred individuals were C. mydas (96.2%), three individuals were E. imbricata (2.9%) and one individual was a L. olivacea (0.9%) (Table 1). Bycatch occurred in 62.3% of monitored sets (Fig. 1) with an overall bycatch rate of 1.96 ± 0.44 turtles set-1 (range = 0-16 turtles set-1). fate, July 2013 to June 2014. CCL: curved carapace length. The number of turtles caught varied by season. 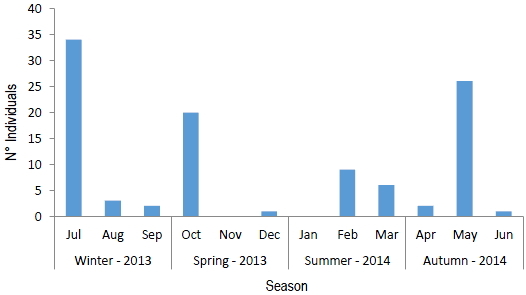 The largest number of captures occurred during winter (n = 39), followed for autumn (n = 29), spring (n = 21), and summer (n = 15) (Fig. 2). The month with the highest number of caught turtles was July (n = 34) while the months with the lowest number of captures were December and June (n = 1, each month) (Table 2). Logistical constraints and poor weather conditions precluded the gathering of observer data of the fishing trips for the months of November 2013 and January 2014 at Constante port. turtles km-1 12 h-1), July 2013 to June 2014. Of the 104 turtles caught, we obtained complete morphometric data from 99 individuals (Fig. 3). The remaining five animals for which data collection was not possible were all C. mydas. 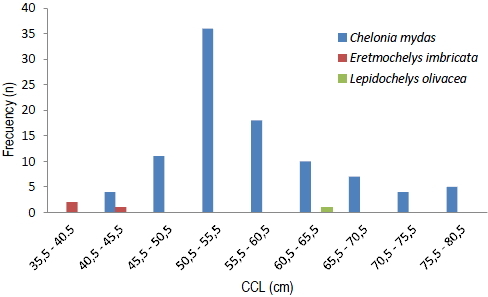 The observed CCL by species was 57.3 ± 0.9 cm (range: 40.5 cm to 79.6 cm) for C. mydas; 40.2 ± 2.4 cm (range: 36.5 to 44.6 cm) for E. imbricata, while the only olive ridley L. olivacea measured 64.1 cm CCL. Of all turtles captured, 28.8% (30 individuals) were recovered dead (28 C. mydas and 2 E. imbricata). The remaining 71.2% (74 individuals) were captured alive, tagged and released. These consisted of 72 C. mydas, one E. imbricata, and one L. olivacea. Bay, July 2013 to June 2014. The overall CPUE observed was 1.11 ± 0.31 turtles km-1 12 h-1 or 0.11 ± 0.03 turtles km-1 12 h-1. Sets during the winter had the highest observed CPUE with a mean of 1.94 ± 1.58 turtles km-1 12 h-1 or 0.19 ± 0.10 turtles km-1 12 h-1. Similarly, the CPUE varied among months. July recorded the highest CPUE with 5.11 ± 2.65 turtles km-1 12 h-1 or 0.43 ± 0.22 turtles km-1 12 h-1, while December had the lowest CPUE with 0.16 ± 0.1 turtles km-1 12 h-1 or 0.01 ± 0.01 turtles km-1 12 h-1 (Table 2). The annual bycatch for the Constante Port was 183 sea turtles. Recent declines of large marine vertebrates, such as sea turtles, seabirds and marine mammals, have focused attention on the ecological impacts of incidental take, or bycatch, in global fisheries (Oravetz, 2000; Wallace et al., 2010; Lewison et al., 2014). Sea turtles are incidentally captured in almost all fishing gear, including trawl nets, gillnets, pelagic and bottom longlines (Lewison et al., 2004; Rosales et al., 2010). Among these, gillnet fisheries may be the single largest threat to sea turtle populations (Gilman et al., 2010; Wallace et al., 2010). In Peru, gillnets were reported as the main source of turtle mortalities in artisanal fisheries from 1986 to 1999 (Estrella & Guevara-Carrasco, 1998a, 1998b; Estrella et al, 1999a, 1999b) and have been the focus of attention in recent years (Mangel et al., 2010; Wang et al., 2013; Ortiz et al., 2016). Our results suggest that gillnets are an important source of bycatch and mortality of sea turtles in Sechura Bay, being a threat to the sea turtles populations in this important foraging and developmental habitat (de Paz & Alfaro-Shigueto, 2008; Santillán, 2008). Studies of the sea turtle bycatch suggested that bycatch rates reported for gillnets in Sechura Bay are among the highest in the world (Wallace et al., 2010; Alfaro-Shigueto et al, 2011). Alfaro-Shigueto et al (2011) reported that is notable the high proportion of bycatch-positive sets and high CPUE for green turtles in the bottom set nets at Constante port (56%; 2.78 turtle per set). Caceres et al. (2013) observed that all monitored trips with sea turtle interactions were by bottom set net boats. These bycatch rates are similar to the present study, reporting that 62.3% of observed sets had bycatch. The mean CPUE was approaching two turtles per set and the mortality rate was 28.8%. These values are of concern and we anticipate that would be higher in the absence of onboard observers. Our bycatch results are in agreement with other studies investigating sea turtle bycatch by net fisheries in Peru. A study in Pisco-Paracas, De Paz et al. (2002) reported a total of 204 sea turtles caught in gillnets during 276 monitored days, with the bycatch consisting of C. mydas (67.8%), L. olivacea (27.7%) and D. coriacea (2.9%). Castro et al. (2012) monitored 265 fishing operations from Lambayeque, from which a total of 383 sea turtles were captured: being 80.4% olive ridleys, 19.3% green turtles and 0.2% hawksbill turtles. Cäceres et al. (2013), collected data from the Constante Port and recorded that 43 green turtles were captured during 14 monitored trips. Rosales et al. (2010) in Tumbes registered 95 specimens belonging to four sea turtles species (Chelonia mydas, Lepidochelys olivacea, Dermochelys coriacea and Eretmochelys imbricata); the most registered species were C. mydas (64.2%) and L. olivacea (30.5%). In each of these studies, C. mydas was one the most frequently caught species of sea turtle. Our results reinforce these findings, we observed the capture of 104 sea turtles, of which the vast majority were C. mydas (96.2%), followed by E. imbricata (2.9%), and one individual L. olivacea (0.9%). The results reported in this research suggest that the bycatch in gillnets is one of the main cause of mortality of sea turtles in this area. We reported a mortality percentage of 28.8, being higher than the reported in industrial shrimp trawlers vessels of eastern Venezuela (17.5%) (Alio et al., 2010). The CPUE of 0.61 ± 0.22 turtles set-1 reported by Rosales et al. (2010) in Tumbes for a research of three years was lower than the reported in this study (1.96 ± 0.44 turtles set-1). However the annual bycatch rate was lower than the report in the same area by Alfaro-Shigueto et al. (2011), reporting a high proportion of bycatch-positive sets and obtained an annual bycatch rate by this fishery of 368 sea turtles. This study also reported a high bycatch per unit effort (BPUE) for green turtle (2.78 turtles per set), and a mortality rate of 41%, being it higher than the results obtained in this study. As part of experimental research carried out from 2011 to 2013, also in the Sechura Bay demersal gillnet fishery, Ortiz et al. (2016) obtained a CPUE of 1.40 ± 0.16 green turtles km-1 24 h-1 in control nets, this bycatch rate is similar to our observed CPUE of 1.11 ± 0.31 turtles km-1 12 h-1. Given these high rates of observed bycatch, in order to secure long-term population viability and to conform with international guidelines for responsible fisheries (FAO, 2009), sea turtle bycatch mitigation solutions for these fishery need to be identified to minimize the number of bycatch mortalities (Nguyen et al., 2013). While net modifications have, in some cases, resulted in megafauna bycatch mitigation in certain fisheries without substantial reductions in target catch, mitigating net bycatch has proven challenging because nets are inherently nonselective (Peckham et al., 2015 & Gilman et al., 2010). However, recent research, conducted in-part in the Constante demersal set-net fishery, suggests that sea turtle bycatch in gillnets could be reduced through illuminating nets (Wang et al., 2013 & Ortiz et al., 2016). The sizes of C. mydas captured in Sechura Bay in this study corresponded to a population consisting of juveniles (89.5%) and sub-adults (10.5%). The mean CCL = 57.3 ± 0.9 cm (range = 40.5 to 79.6). In this same area, Santillán (2008), analyzed the fishery bycatch from Constante Port and found a mean CCL for green turtles of 63.6 ± 1.6 CCL (range: 47.5 to 88 cm; n = 45), indicating a concentration of juvenile and sub-adult turtles. Cáceres et al. (2013), obtained a mean CCL of 60.2 ± 6.8 cm (range: 52 to 92 cm), and thus considered all as juvenile turtles. Paredes et al. 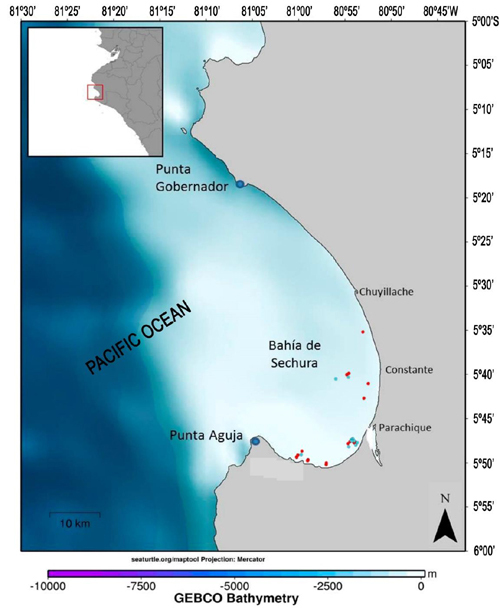 (2015) in Virrilá estuary reported a mean CCL of 59.2 ± 10.2 cm (range = 30.9-89.7 cm) indicating a population represented by juveniles (62.6%) Our results suggest that this bay harbor an immature population. In the Eastern Pacific Ocean (EP), the hawksbill turtle has been reported as once "common" from Mexico to Ecuador (Alfaro-Shigueto et al., 2010a; Gaos et al., 2010) recruited to neritic habitats (Scales et al., 2011). Studies in Máncora, Constante and Parachique, from 2000 to 2005, found a mean CCL of 38.9 ± 5.9 cm (range 28.3-49.0 cm, n = 11), indicating a population of mostly immature individuals (Alfaro et al., 2010a). Quiñones et al. (2011) in the San Andrés area, reported a mean CCL size of 45.2 ± 3.2 cm, and they concluded that juveniles and sub-adults used this area as a foraging ground. We reported the incidental capture of three E. imbricata, with a mean CCL of 40.2 ± 2.4 cm (range: 36.5-44.6 cm). This size corresponded to juvenile individuals and is similar to other reports for the northern coast of Peru. Kelez et al. (2003) measured 16 carapaces of L. olivacea from Tumbes to Ancash (Peru) from 2001 to 2002 and reported a mean CCL of 66.6 cm. For the year 2008, in Tumbes, measurements of 47 L. olivacea carapaces yielded a mean CCL of 63.3 ± 4.5 (range: 51 -70 cm; n = 47) indicating the presence of juveniles, sub-adults and adults (Forsberg, 2012). Our observed bycatch of one L. olivacea with a CCL of 64.1 cm is consistent with a sub-adult sized individual. Gillnets are a significant source of sea turtle bycatch in Sechura Bay. Our results indicate that Sechura Bay is an important foraging area and developmental habitat for green turtles and also possibly for critically endangered hawksbill turtles. This research found that a majority of sets having bycatch, given these catch rates; we recommend the identification and implementation of mitigation measures to reduce sea turtle bycatch, like illuminating nets with LED lights, shark silhouettes and use float lines without buoys (Gilman et al., 2010; Wang et al., 2010, 2013; Ortiz et al. 2016). To help maximize their uptake and effectiveness, such efforts to identify solutions should involve small-scale fishermen as well as scientists and other stakeholders and decision-makers. Enhanced management and protection of this bay that acknowledges its importance as a developmental habitat and foraging ground is recommended. To decrease sea turtle captures and commerce, efforts are needed to offer fishermen new economic alternatives. Additional efforts should include an education and research program targeting the Sechura Bay community. We want to acknowledge the fishermen of Constante Port for their generous collaboration in the monitoring trips and Pro Delphinus staff biologists who provided data and field work. To biologist Armando Ugaz of National University of Piura for his unconditional support in this research. This study was conducted with support of the National Fish and Wildlife Foundation-NFWF, Whitley Fund for Nature-WFN, Darwin Initiative Sustainable Artisanal Fisheries Initiative in Peru- DEFRA, University of Exeter and Prodelphinus. Besides sample collection was made possible by General Direction Resolution N° 002-2014- SERFOR-DGGSPFFS.